TO SHOP: Select the product you want in the pull-down menu under each product description and press the Add to Cart button for each item. When you press the Add to Cart button, you will be routed to a secure PayPay® shopping cart page where you can select the quantity you desire. The Shopping Cart gives you the option of returning to shop for more items and add them to your cart. Shipping charges and tax (sales tax applies to MN residents only) are calculated and reviewable prior to your final check-out. Costs shown are in US Dollars (USD). Rush shipping is available at an additional cost. Please contact us for more details on rush shipping options. Points Of View also accepts PayPal® worldwide purchases and ships internationally. NOTE: A PayPal® account is NOT required to shop via the PayPal® Shopping Cart. OR order directly from Points Of View by calling 1-952-472-3379. Visa/MasterCard/Discover/American Express are accepted. If you are a tax exempt organization residing in Minnesota and wish to claim a tax exempt status on your order, please place your order by phone at 1-952-472-3379. See our How to Order page for our office hours and ordering details. To purchase, click on the book's image and you will be sent to CreateSpace.com – the company that fulfills our print-on-demand service for this book. Go to ElderEye.com to find other publications offered by ElderEye Institute Press and its clients. Together for Tomorrow: Building Community Through Intergenerational Dialogue, is a guide and information resource to help you break down isolation and separation between the generations. It presents a proven process for community building: the Intergenerational Dialogue™ process. Intergenerational Dialogue is a tool for joining all ages, cultures, races, genders and economic classes in problem solving and joint action. In its fifth edition, this easy-to-use, 202 page, paperback book is a valuable resource book for anyone working in the areas of: intergenerational programming; family relations; health & long term care; community education; community organizing; human relations training; public policy; healthy community initiatives; violence, alcohol, and drug prevention; social work; agricultural extension; aging networks; diversity initiatives; and homeland security. $29.95 each (USD), plus shipping and handling and applicable sales tax. All Are Welcome: A Primer for Intergenerational Ministry and Dialogue, is designed to be used by communities of faith. This book demonstrates how to break down isolation and separation between the 6 living generations found in congregations. It presents the Intergenerational Dialogue™ process as a proven tool for joining all ages, cultures, races, genders and economic classes in Intentional Intergenerational Ministry (IIM). In its second edition, this 176 page, paperback book is a valuable resource for anyone working in the areas of: congregational education; stewardship; congregational revitalization & turnaround; missions; seminary education; community outreach; public policy; healthy community initiatives; asset development for youth & families; social ministry; spirituality & aging networks; and diversity initiatives. $24.95 each (USD), plus shipping and handling and applicable sales tax. Generations is an informative, 8-page booklet that discusses the essential differences between the 5 currently living generational groups. The brochure shows what a 10–14-year-old of the GI, Adaptive, Boomer, GenX, and Millennial generations experienced politically, economically, culturally and socially as they formed—and in the case of the Millennials, are forming—their basic value system. $6.00 each (USD), plus shipping and handling. (MN residents, 7.275% sales tax will be added to your order.) Contact us for quantity discounts. Generations in the Workplace, an 8-page booklet that discusses the essential differences between the 5 currently living generational groups by taking a workplace culture approach. The brochure shows what a 10–14-year-old of the GI, Adaptive, Boomer, GenX, and Millennial generations experienced politically, economically, culturally and socially as they formed—and in the case of the Millennials, are forming—their basic value system. It is similar to the Generations booklet above but is more directed toward a business audience. Maggie. In this rare, 20-minute videotaped interview with Maggie Kuhn, the founder of the Gray Panthers, Maggie speaks out on the need for an intergenerational movement, what the old and young have in common, the "four M's" for older adults, the importance of the spiritual dimension, caregivers and care receivers—and the Gray Panther Growl! Viewer review: "This tape is one of the most powerful tapes I have heard in years. Maggie Kuhn is truly intergenerational in her perspective and ageless in her demeanor—and absolutely persuasive in her clarity about intergenerational challenges." Click here for more information and for a link to order the DVD. 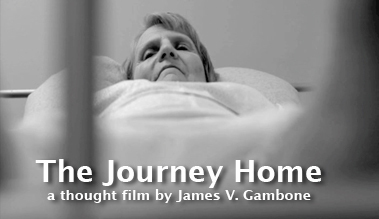 The Journey Home is a 10-minute “thought film” intended to provoke a deeper awareness of and conversation about the issue of long term care—a subject that will be of high interest during the next 25-30 years. This film will provide a platform for conversation and hopefully, provoke action toward addressing the issues of long term and end-of-life care. In this book, small- and medium-size business owners representing many business sectors—including service, manufacturing, production and distribution—share their succession experiences when transitioning from the companies they formed and managed for decades. Their successes, failures, and “lessons learned,” make up the core of this timely book. It's an easy-to-read guidebook for what to do and what not to do when planning a business transition. Who Says Men Don't Care? A REAL BREAKTHROUGH FOR MALE CAREGIVERS… A CAREGIVING GUIDE WRITTEN EXCLUSIVELY FOR MEN! What kind of caregiver are you? Are you the Manager, the Searcher, the Loner, the Techno-Virtual Caregiver, or some combination of all of the above? You can find out with the new Guide for male caregivers. While there are many excellent caregiving resources available for all kinds of diseases and illnesses, Who Says Men Don’t Care? is unique because it is written specifically for four generations of male caregivers. The premise of the Guide is that men care differently than women, and these differences present both opportunities and potential problems in all male caregiving situations. Knowing who you are can make you a healthier and more balanced caregiver. Go to ReFirement.com to discover other publications offered by ReFirement. ReFire Your Life! gives Boomers and others a positive and optimistic vision of how to live a meaningful life as they grow olderto leave a valuable legacy for future generations. It provides an exciting platform for everyone facing the challenges and opportunities of mid-life. This book is engaging, practical, and life-transforming. Read the Introduction to ReFire Your Life! now on the ReFirement.com website. To purchase, click on the book image and you will be sent to CreateSpace.com – the company that fulfills our print-on-demand service for this book. Jim Gambone, author of ReFire Your Life! has teamed up with Erica Whittlinger, Debby Magnuson, and Personnel Decisions International to create The ReFirement Workbook. • Create a strategic plan to follow your bliss! 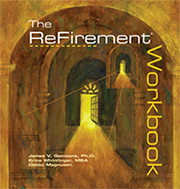 See The ReFirement Workbook Table of Contents and Introduction on the ReFirement.com website. Even if you've read the original ReFirement book, you will find new exercises and more ReFirement life strategies to help you create the life you wantat whatever stage of life you're in. $17.95 each (USD), plus shipping and handling. (MN residents, 7.275% sales tax will be added to your order.) Contact us for quantity discounts. The 75% Factor: Uncovering Hidden Boomer Values – A report challenging current assumptions about the Baby Boom Generation! This document reveals never-before seen research findings by Dr. James Gambone relating to Boomer values and how those values impact other generations and Boomers themselves. It will make you reconsider who Boomers really are. Despite everything written and broadcast about Baby Boomers, one major fact has been overlooked by experts and the media: Nearly 75 percent, or about 57 million Boomers, come from economically poor, working class or small family-owned business roots. These findings are highlighted in this report co-written by James V. Gambone Ph.D and Erica Whittlinger. This report is available electronically as an e-mailed PDF document or as a mailed printed document. Contact us for quantity discounts. PDF Version – $12 (plus sales tax for MN residents) Allow up to 24 hours for the file to arrive in your email box.